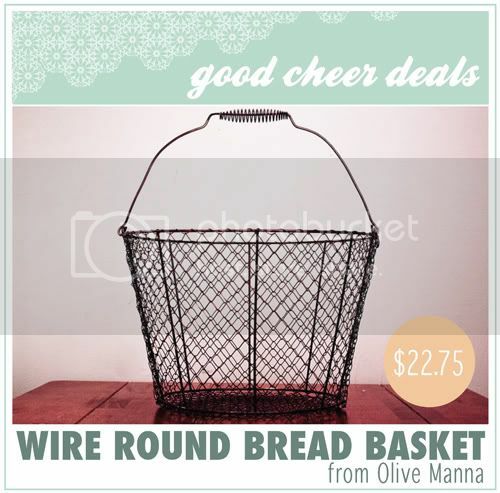 Today's good cheer deal comes from Olive Manna, one of my personal favorites. She's offering up 3 styles of her new wire baskets. I really love wire baskets! You can do so much with them. Grab one for 30% off the listed price and get free shipping too! What a deal :) Happy Monday friends! Good Cheer Price: $22.75 w/free shipping! Good Cheer Price: $19.25 w/free shipping! Good Cheer Price: $26.25 w/free shipping! - 50 baskets available, limit 5 per customer. USA residents, all other countries the cost is $10 to ship a basket. - This deal is open all week long, or until items are sold out. - Please be sure to visit Olive Manna and support! Hey lady I'm also running a Shabby Apple Dress giveaway today! If you get a chance be sure to enter!! I am new to your blog and have been enjoying it very much over the past several days. Just got one egg basket and one oval basket - great deal! Thanks for the good cheer, and for the introduction to Olive Manna. Happy Monday to you too! Love the rectangle wire basket. Such cute baskets, I love all the character. Couldn't resist the round basket...thanks for such a great deal! I am obsessed with her! - I hope you are having a great day, friend! I want one of these so bad! They are amazing. I hope there are some left Friday when I get paid! Oh, that rectangle basket would be so lovely for magazines in my new workspace...turning my head! Are the prices for the Bread Basket and Egg Basket mixed up? Above the Bread Basket is listed as $22.75 but below the Egg Basket is listed as $22.75. I'd like to purchase the Bread Basket but want to be sure I'm paying the right price. Thanks!